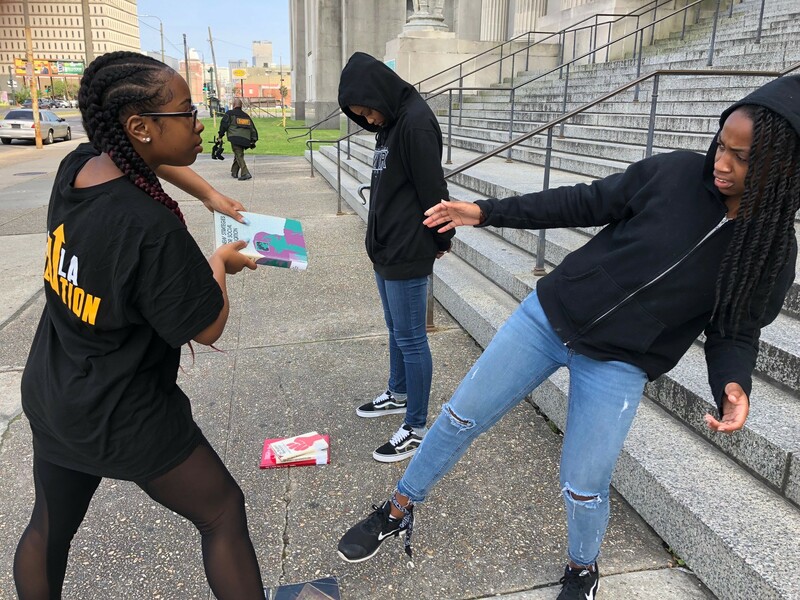 Editor’s Note: On April 9, 2018, Xavier University undergraduates staged site-specific performances as protests of the criminal justice system in New Orleans, targeting issues such as the school to prison pipeline, the lack of educational access inside prisons, and wrongful convictions. 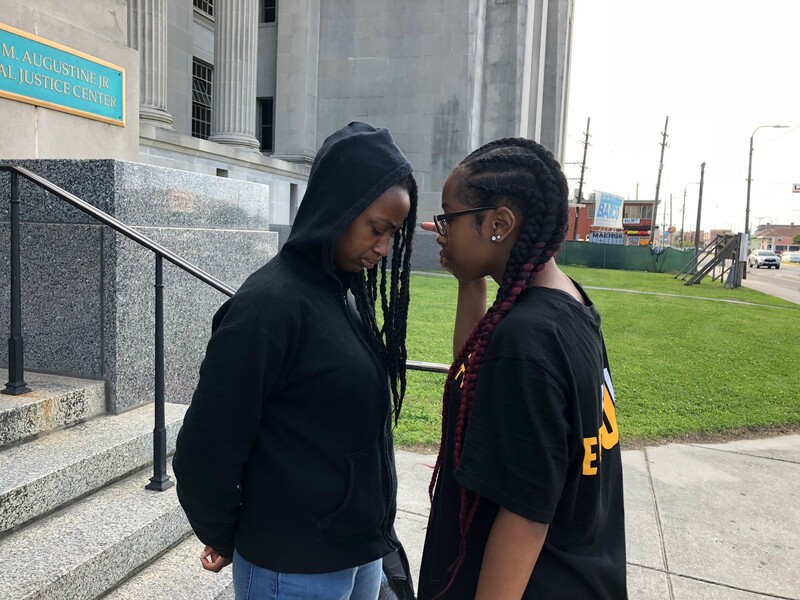 Students performed at the Israel Augustine Criminal Justice Center and the Orleans Parish Sheriff’s Office. Their work emerged from a course titled “Site-Specific Performance” taught by Dr. Ross Louis and organized as a series of experiments that produced public knowledge about physical sites in the New Orleans area through contributions to digital humanities platforms like ViaNolaVie and New Orleans Historical and site-specific performances staged for a public audience. 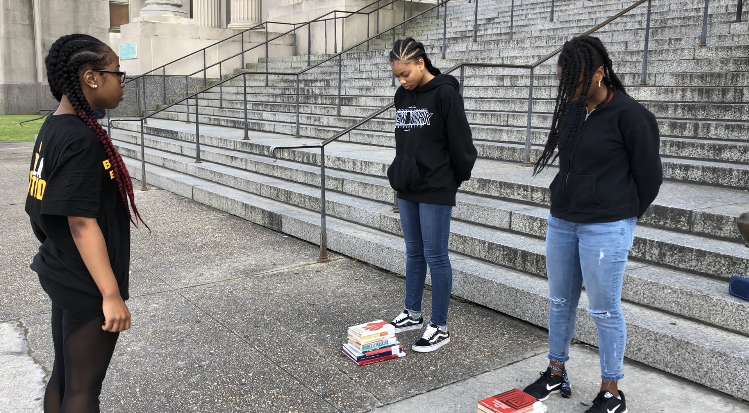 Students examine the interdisciplinary tradition of site-specific performance from the perspectives of visual art and performance studies. The course is supported by Xavier’s Performance Studies Lab. 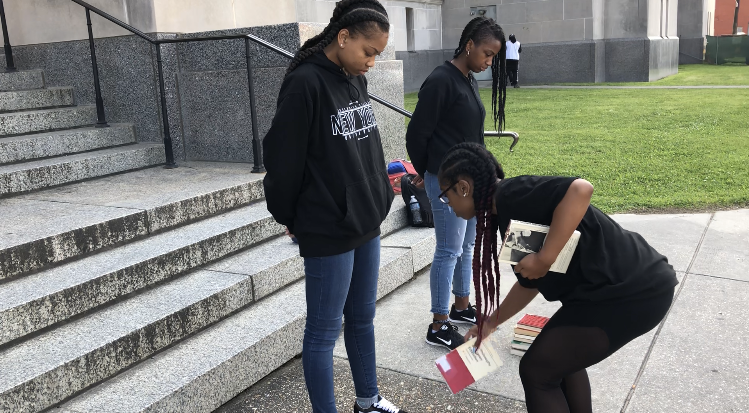 Xavier University students Punasia Hernandez, Dasia Moore, and Elizabeth Page protested the removal of college-level education from prisons through a performance (“Obstruction of Justice”) at the Israel M. Augustine Criminal Justice Center. The site was selected for its wide range of potential spectators: judges, lawyers, defendants, and former and prospective inmates. 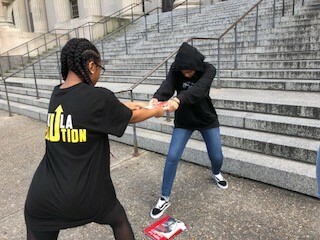 Two of the students (Moore and Page) played the roles of prisoners from Louisiana while the third student (Hernandez) represented authoritative “enforcers” in the criminal justice system. In a repeated cycle, the “enforcer” takes books away from prisoners one by one, with little interference or resistance. Throughout the entire performance, recordings of college students’ opinions on the removal of higher education can be heard in the background. 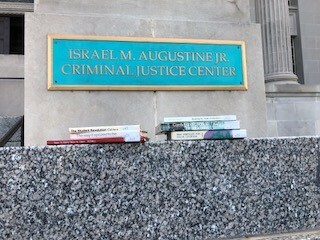 The books used in the performance all pertain to education, which is under threat of removal within the criminal justice system. The disheveled state on the ground comments on the shaky educational foundation that prisoners have, but also the potential to build upon it with educational assistance. The performance begins with a series of interviews playing from a speaker, all related to the issue of education in prison. Interviewees are heard answering the question, “Do you think that prisoners should have access to college level education?” The performers stand frozen in a tableau during the first interview. 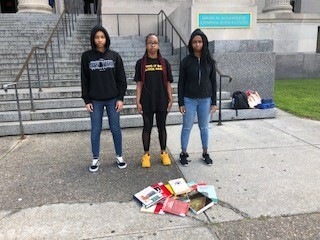 Positioned as prisoners, two performers stand with their hands behind their backs in a handcuffed position, with stacks of books on the ground near their feet. The third performer, portraying a figure of authority, faces them with her back to the audience along Tulane Avenue. The authority figure then removes the books, one by one. After taking away the prisoners’ books, the authority figure taunts them by pointing in their faces. Their heads remain bowed to show inferiority and lack of resistance. 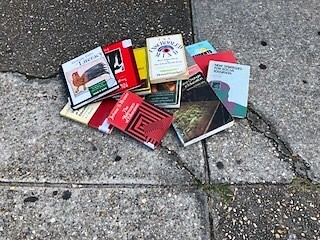 The authority figure repeats the cycle of taking away the books, but encounters a physical struggle with the prisoners, whose attempt to fight for the books represents the knowledge that is being taken from them. When the authority figure repeats the cycle a third time, the prisoners’ struggle for the books gets more intense, resulting in their stumbling and collapsing into their original shackled position. 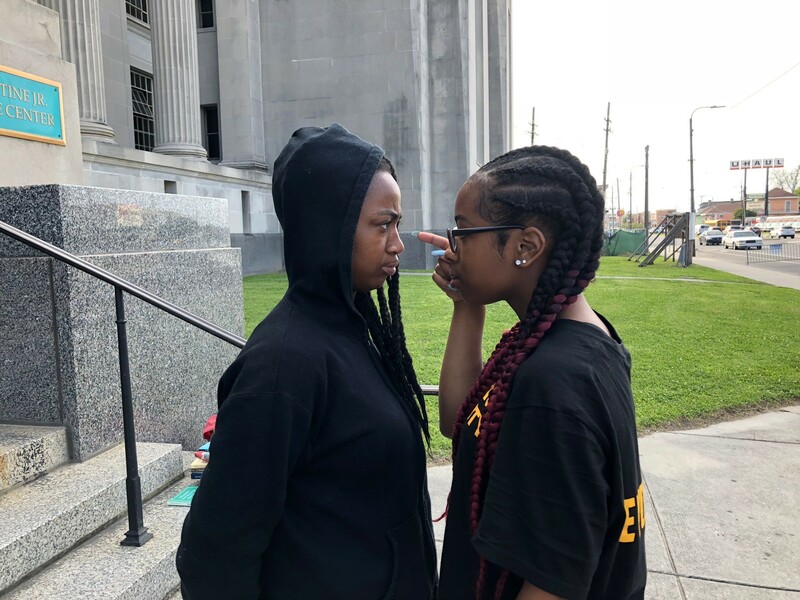 The violation of personal space is addressed throughout the performance and displays the tension between criminal justice systems and their provisions for prisoners. The prisoner’s look of defiance shows a possible resistance to the removal of education in prison systems, as well as possible resistance to other mistreatment.